Infrared studies of T Tauri stars in star-forming regions have suggected that initial disk frequency if rather high and that the disk lifetimes are relatively short Myr. From JHKL photometry, Haish, Lada, & Lada (2001) obtained the fraction of disk-bearing stars for 6 star firmation regions. L band excess emission indicates an accompanied disk. The fraction is a decreasing function of age of the cluster as in Figure 1.6. This figure shows clearly that the disk fraction is initially very high ( ) and rapidly decreases with increasing cluster age. In 3 Myr a half of the disk stars lose their disks. Overall disk lifetime is estimated as Myr. 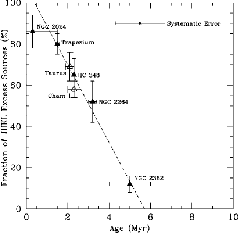 Figure 1.6: Fractions of IR excess sources in respective clusters are plotted againt the age of the clusters.